Working on a lot of political campaign websites and non-profit website designs, some of the most common challenges we tackle are helping organizations build their email list, recruit volunteers, and raise money. It's not easy to convince people to take action -- while people may love your organization and your mission, it's a whole other level of passion required to get them to part with their time and money in support of you. What we, and others in the space, have found is that it's best to build people up to bigger actions through a series of tasks that gradually increase in what's required of them. If you cold-ask someone for a $100 donation, you're a lot more likely to get rejected than if you spend time building a relationship with them, educating them on your organization, and working them up to bigger actions. This approach of cultivating casual supporters into advocates and donors is commonly referred to working them up the Ladder of Engagement. Each rung on the Ladder represents a progressive action taken by the supporter where they give you more data, engage more closely with you, and become a little more invested in your organization. By slowly working supporters up your organization's Ladder of Engagement, you're turning casual supporters into donors, volunteers, and advocates. Every organization's Ladder is different, as there are always different actions and end-goals you may be working toward. Campaigns are typically looking for a monetary contribution and your willingness to lobby friends to do the same. A non-profit like Habitat for Humanity may want to work up to getting you on a job site and also donating to that project. There can be multiple ultimate conversions, but in each case you will want to gradually work your supporters up to your biggest asks by having them complete smaller tasks upfront. To help visualize how this process works, I've plotted an outline of an example Ladder of Engagement below, using the actions the Obama campaign used to cultivate volunteers and donors. One of the easiest actions someone can take is Liking your organization on Facebook. It's easy to advertise on Facebook for likes or encourage your friends to Like you or even offer prizes for your Facebook supporters. 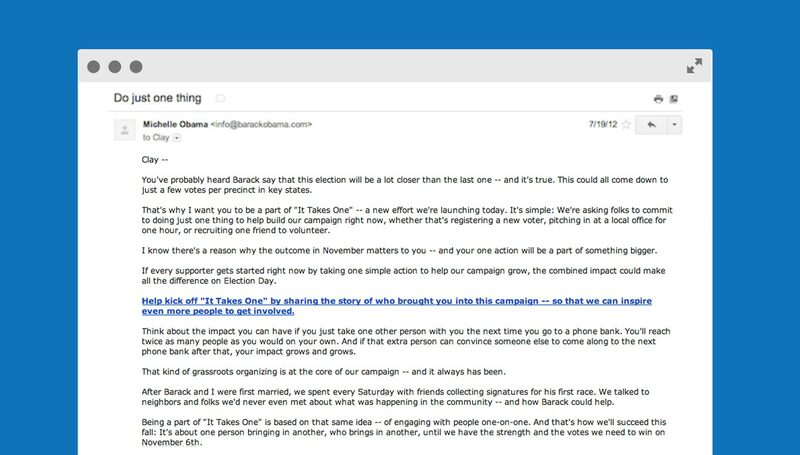 In the case of a high profile organization like the Obama campaign, many statewide races, or popular non-profits, you will also likely gather a lot of Likes from people who are just generally interested in you and the space, but not particularly devoted to you. People will Like the page just for updates from your organization, and that's exactly the type of conversation you want to have to help engage them with your mission. These are the type of supporters that you can slowly work up to donors and volunteers. 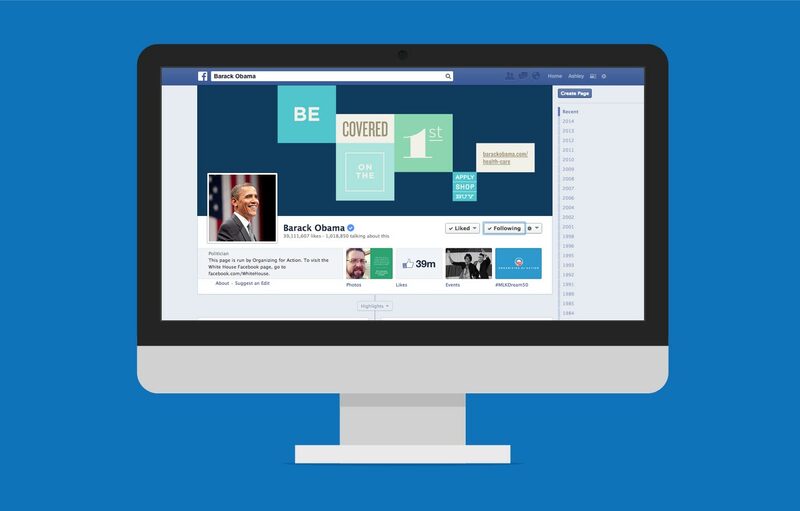 For those supporters that Liked your organization on Facebook, you now have the powerful ability to target them with small asks through status updates and ads directed at supporters. They've opted in to receive updates from you, and it's now up to you to craft a compelling message to convince them to take the next step, which in this case is giving you some data so you can email them. 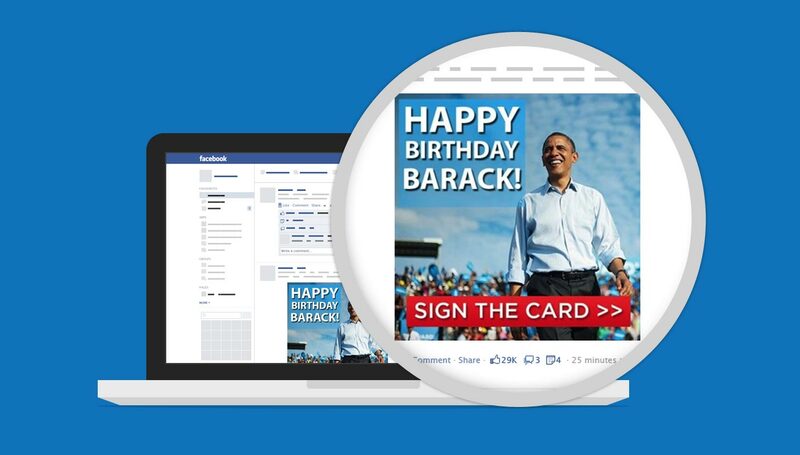 The example here is asking Facebook supporters to sign a birthday card for the President -- the ask is simple and rewarding. Supporters actually feel like they're getting something in return by signing the card, as they were able to send a message to the President of the United States! This action moves the supporter up to the next rung where they've actually given you some of their data and opted into more direct conversations. 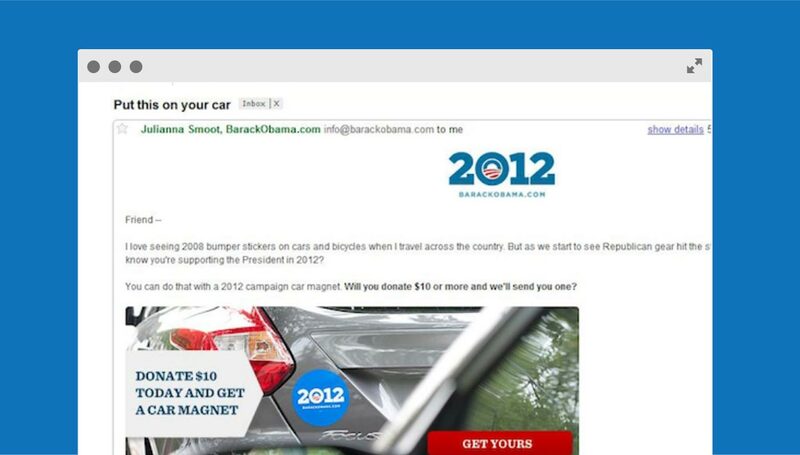 With the email address, the campaign still doesn't jump straight into the ask. They continue to slow play their hand, engaging in a conversation with supporters and continuing to offer things in exchange for subsequent actions. In this case, it's a personal (!!) email from the First Lady, asking the recipient to share a personal story. The campaign is saying they want to learn from their supporters, making them feel involved and invested, and building the conversation. When someone clicks the link to add their story, they're not only giving you more data, but they're also signaling they're more invested than ever. One tactic that we find especially powerful at this rung are issue-specific petitions, as people want to add their name in support of an issue and are willing to share it with their own networks. We're now three rungs high on the Ladder -- the campaign has not asked supporters to part with time or money, and they have made recipients feel like a part of the team. They're building toward more advanced asks by making supporters more engaged than ever; it's a lot harder to say no to a donation ask after you've already built a "personal" relationship with your supporters. You've now got a lot of information and know a lot about your supporter, which makes it an opportune time to finally ask for a contribution. In this campaign example, it's the first donation, so they place it on a rung below a full blown donation ask, as they're requesting a small amount ($10) and also offering a car magnet in return. The mental math someone would be running at this point makes it seem less like a donation and more like a transaction. On top of that, it's not a transaction with some stranger, but with a good friend who has only "given" things and never asked for anything. If this ask doesn't work, don't worry there will be plenty to follow and there will be other offshoots of the previous rungs to try and keep the supporter engaged with the campaign. One of the most important tactics with all of these asks is repetition -- it takes a lot of impressions and calls to action before someone may act, but that action will ultimately be very valuable to you and it's worth continuing to get in front of them. The campaign has moved that casual Facebook supporter to a donor pretty quickly. Now that the supporter has moved to the top rung by making a small donation, the campaign knows they're fully bought in. The campaign will increasingly ask for greater donations, more volunteer time, and more. 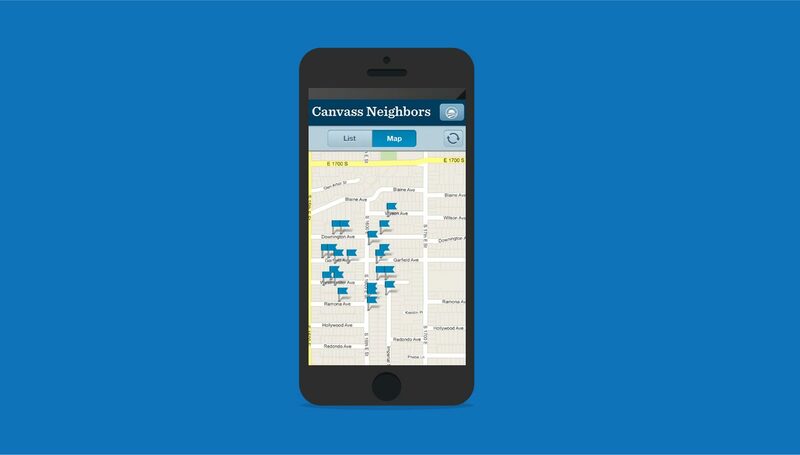 One of the top actions from the Obama campaign was to get volunteers to download a mobile app and walk around the neighborhood asking friends for support. Just because a supporter is on the top rung doesn't mean you should revoke their perk privileges; you should continue to offer benefits in exchange for increased levels of support, but the relationship will now be much more focused around the top rung aspects since the supporter has already crossed the mental threshold of parting with money and time to support the effort. Get creative with it. Online petitions around an issue or a birthday card for a candidate may seem common place now, but they really just started growing in popularity in the past few years. Feel free to use those tactics, but also work on thinking of creative ways to get people to start engaging. With your own process and Ladder of Engagement, you should be able to convert a much larger proportion of your supporters in your ultimate action, as you're building a long-term conversation with them and not immediately asking for a big donation. Share any of your stories or tactics in the comments and best of luck building out your own online campaign! Very helpful information specifically the final phase :) I handle such information much.